a view from the cobblestones: swapping hats with the Pope! I swapped hats with the pope today! Yes! Browsing through some liturgical goods stores here in Rome yesterday, I found one that sold white zucchetos - papal hats. I got one and brought it to the Wednesday audience today, held it out to the pope as he exited, and lo and behold he stopped his car, told the guard to get my hat, took his hat off, and put on the one I had brought. It was only for a moment, then he put his own back on and gave mine back to the guard to give to me. Wow! I'm telling you, he is one extremely kind man! Tomorrow we’re off to visit Assisi, I will pray for you all at the tomb of Saint Francis. What with swapping hats with the Pope and all, I’d say we’ve been quite blessed this pilgrimage! PS: The Pope's talk today was all about the recent Synod on the Family and what actually happened. 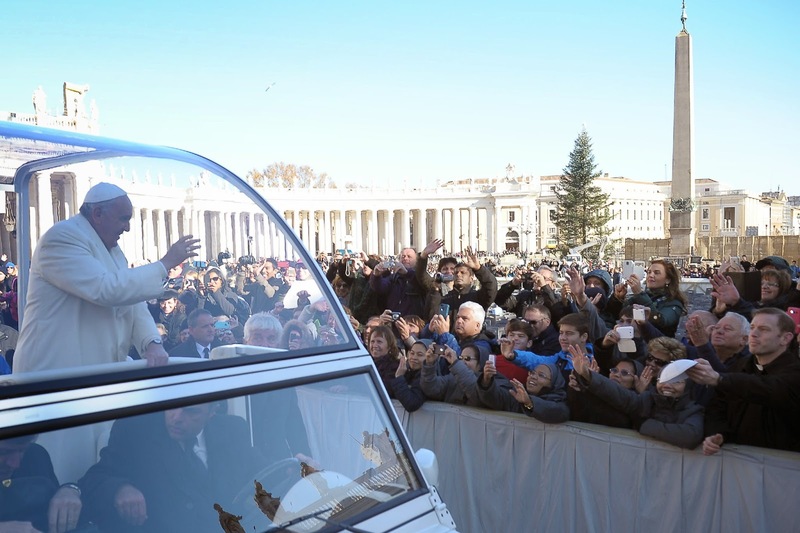 To make a long story short, the Pope said it was a moment for bishops from all over the world to freely voice their opinions about Church teaching on marriage and the family. And he stated emphatically that "no intervention challenged the fundamental truths of the Sacrament of Marriage: indissolubility, unity, fidelity, and openness to life."